We take a look at some hair colors that are well suited for warm skin tones. Choosing a hair color is so important for your overall image. We take a look at some hair colors that are suited for warm (fair, medium and dark) skin tones. If you have warm fair skin, choosing the wrong tone or shade can leave your skin looking ruddy and sallow—definitely not a good look! If you have fair skin but are not sure if it’s warm or cool, hold something silver next to your face. Then hold up something gold. If you have warm tones, your skin will look radiant next to gold, and ruddy next to silver. Once you have that sorted, check out some fabulous shades for a warm fair skin tone. Taylor Swift's warm fair skin goes great with her dark golden blonde color. This is an ideal shade for women who have naturally dark blonde or light brown hair color who want a slight golden sheen to their hair. Rachel McAdams flaunts light buttery blonde hair with platinum highlights. This multidimensional look works great with her warm fair skin and gives her a radiant glow. Liv Tyler shows us that having fair warm skin doesn’t mean you have to stick to blonde tones. Her golden brunette locks flatter her fair skin and make those blue eyes pop! Milla Jovovich opts for a light copper brown shade which brings out the warmth in her skin. This color is ideal for emphasizing blue or green eyes. If you have warm medium (or olive) skin, choosing the right hair color can make or break your overall image. Colors that are too neutral will make you look washed out, while colors that are too brassy will take the natural richness out of your skin. Most people with this skin tone have a natural brunette or dark brown-black color to their hair, but it is possible to go blonde if done correctly. If you need some hair color inspiration for your warm medium skin tone, check out these color ideas. Shailene Woodley flaunts a deep chestnut color that flatters her warm skin tone. There are dark copper highlights in the ends which gives her natural color depth and dimension. Tiffani Thiessen shows off her golden blonde locks that look great with her matching skin tone. This color looks extra hot if you have a light eye color like Tiffani. You can go to the opposite end of the spectrum with dark espresso locks like Kourtney Kardashian. This color looks fabulous on women with dark brown eyes. Go for a warm rich dark brown for best results. 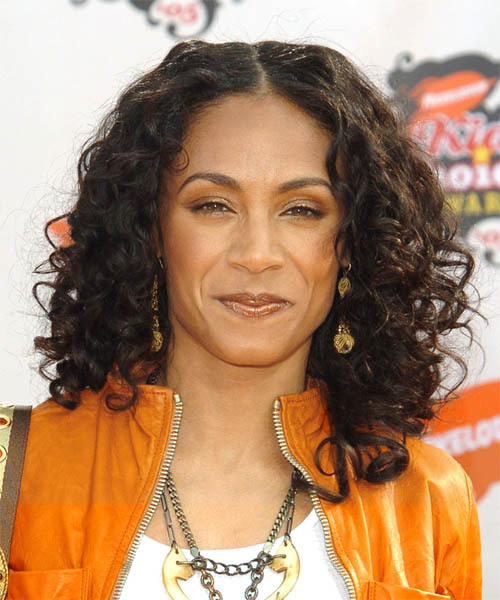 Jada Pinkett Smith looks hot in this monochromatic dark brown shade. Her skin tone looks fantastic with this color, not to mention her warm bronze makeup palette. One thing is for sure--Ms Pinkett Smith knows how to work her skin tone and makeup! If you have warm dark skin, count yourself blessed! Your natural hair color is most likely black or dark brown, but that doesn’t mean you can’t pull off other shades. From subtle to outrageous, you can rock many colors that will harmonize with your skin tone. If you are bored of your current color, take inspiration from these hot celebrity styles. Gabrielle Union warms up her black hair with a few chestnut highlights throughout her long layered hair. Chestnut is a fabulous color for women with this skin tone because it brings out the natural warmth of the skin. 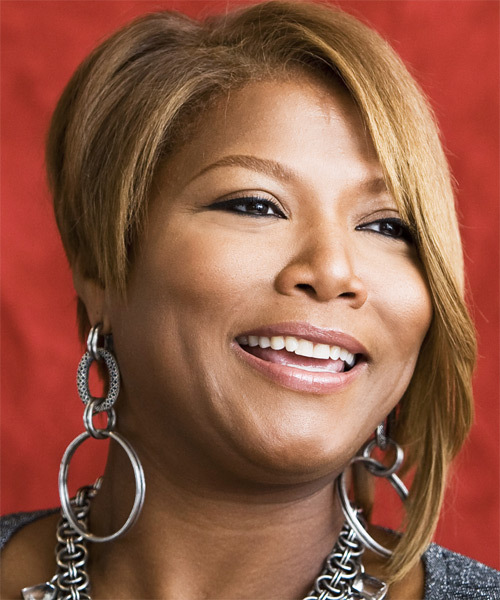 Queen Latifah shows us how to pull off blonde hair effortlessly. She has chosen a beige blonde shade that has just enough warmth in it to match her skin tone, without the dreaded brassy tones. Style icon Iman flaunts golden brown highlights with a deep brown base for maximum glam-factor. This two-toned color gives her face a healthy glow and is the perfect example of how dark warm skin looks fabulous with brunette hair. Another style icon, Naomi Campbell rocks a monochrome espresso shade with fantastic results. The color suits her trendy bob hairstyle while warming up her skin tone. This look is 100% catwalk-ready! If you have a Cool skin tone, please read the article "Hair Colors for Cool Skin Tones"